Glamping has never been more glamorous than at the Beverly Wilshire, a Four Seasons Hotel in the heart of Beverly Hills. Most recognize the luxury property as being the playground for Pretty Woman, but now it’s taking its room offerings to the next level by offering the great outdoors to its guests. 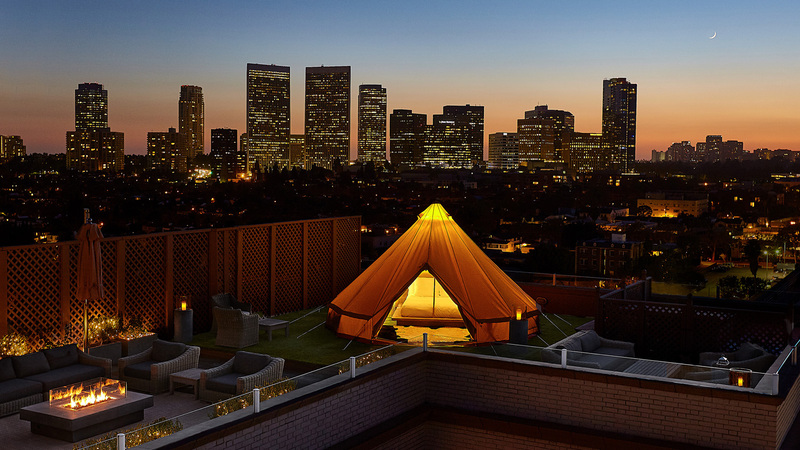 The hotel has just unveiled the first-ever urban glamping experience in Los Angeles available on its Veranda Suite terrace. Your tent on the Veranda Suite Terrace at the Beverly Wilshire Hotel. The experience is possible when you book the hotel’s Veranda Suite. It’s the only room on site that occupies its own floor — 10 stories above the city — and the only way to access it is by using the hotel’s original (circa 1928) wrought iron and marble staircase. Once you reach the suite you can enjoy amenities like 750-square-foot open floor plan, marble bathroom and king-sized bed. But the focal point of the suite is the 2,140-square-foot terrace that showcases 270-degree views of Rodeo Drive and the Hollywood Hills — not to mention that this is also where you’ll find your tent. You may be thinking that there’s no reason to forego that king-sized bed in your room, but the terrace’s expansive tent (16 feet in diameter and more than 10 feet tall in the center) is bound to change your mind. It’s an experience unto itself decked out with a queen-sized bed complete with Four Seasons linens. 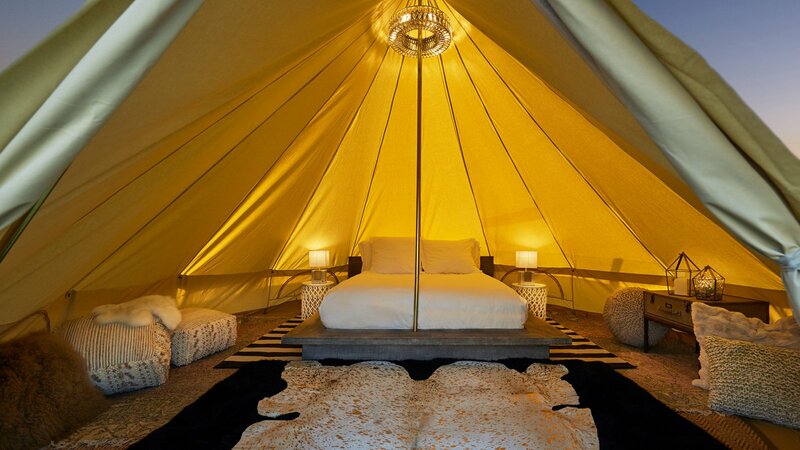 The tent furnishings eclipse any of a normal camping experience, and include crystal chandelier, marble lamps, fur rugs, and antique nightstands. Just outside the tent, while you’re gazing out at the city’s iconic shops, you can bask on oversized lounge furniture in front of a fireplace, and the terrace is even equipped for outdoor dining for eight people. 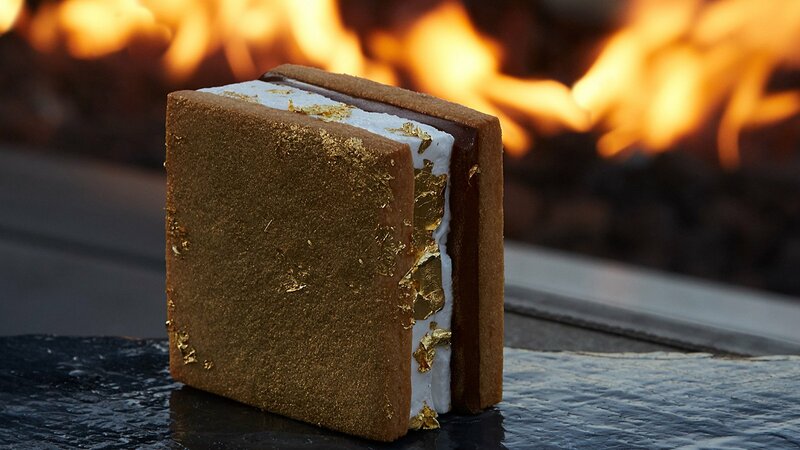 Celebrity Chef Chris Ford makes s’mores with 24 karat gold leaf, Tahitian vanilla bean marshmallow, and a smoked 55 percent Valrhona chocolate bar, which also come paired with a vintage Champagne flight. 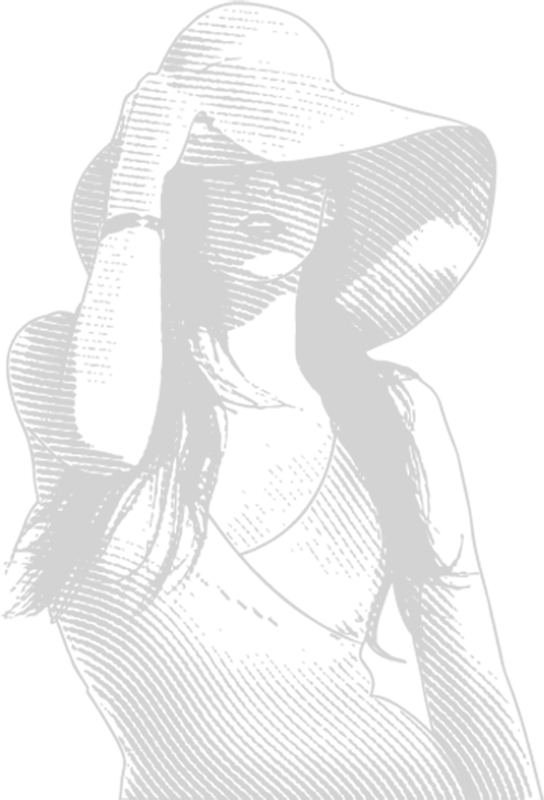 But there’s always more to glamping than the tent and terrace, and braving the luxury outdoors takes its toll. 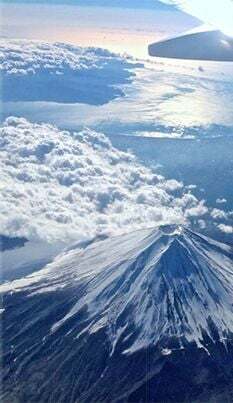 That’s why guests who book this package can opt for a special glamping tasting menu that features roughing it cuisine like Special Reserve ossetra caviar and Japanese Mishima ultra wagyu beef, in addition to elevated, seasonal plates inspired by picnic table favorites. Everyone’s favorite camping treat — s’mores — tops off the dining experience, but with a spin. Celebrity Chef Chris Ford makes them with 24 karat gold leaf, Tahitian vanilla bean marshmallow, and a smoked 55 percent Valrhona chocolate bar, which also comes paired with a vintage Champagne flight. Start packing your backpacks or even opt to travel without luggage, this experience is only available through the end of the year. Rates start at $3,500. Photos courtesy of Beverly Wilshire, A Four Seasons Hotel.